Customers frequently inquire about whether their problems could be occurring due to contamination in their repair materials purchased from MTP. So here is an explanation for most of these issues. It is highly unlikely to receive MMA or Quick Glaze components from MTP with contamination. Contamination usually happens when multiple technicians handle the same product in the factory or in the field. This can happen where two or three shifts occur in a factory. Contamination can occur from alternative products being substituted for MTP products for solvents, reducers, thinners, hardeners and toners. To assure trouble-free results, use only MTP brand components to assure compatibility and quality consistency. When finished with a repair session discard any remaining mixed products. Do not attempt to re-use at a later time or date. This can be especially unforgiving when multiple technicians are using the same product or mixtures from one shift to the next production shift. The paint products, both basecoats and topcoats, are mixed with various thinners and other special purpose chemicals prior to spraying on the surface to be repaired. Therefore, a prepared mixture may last for days before becoming unsprayable. If they are stored and used later, there is high risk of changing the formula, creating issues, if additional chemicals are added to the mixture. For example, multiple temperature thinners added to the product can have an adverse effect on the performance of the product. The absolute best practice is to prepare fresh materials using proper components each time a surface repair session is initiated. Check for contamination, yellowing or amber tones in the product source before mixing. Questions regarding causes of fisheyes in repaired bathtub surfaces have arisen over the years. These can be created from in-plant repairs, or work performed by repair professionals. They can occur in both MMA and Quick Glaze repairs. One source for these problems is from oil or moisture in the spray. Following is a description of how they occur. It is common for compressed air source lines to carry a high concentration of oil and moisture. Moisture is created from condensation as pressure and temperature are changed in the compressor. This is especially true in high humidity regions. With water present, the lines and tank reservoirs can also rust, carrying oxidation through the lines to the airbrush or spray gun onto the repair, which changes the spray color. Oil can impart a color to the spray, also and it can cause fisheyes in the sprayed surface. Water traps simply do not work efficiently to remove these liquids. The picture above shows a common water trap, which our experience shows are ineffective. Regardless of the size or quality, it will not remove 100% of the water or liquids. An industrial grade desiccant filter tower (shown above) works best to remove all foreign liquids. This product is recommended, and can be installed at the air supply source to serve the repair area in manufacturing plants. Contaminated compressed air enters the single tower desiccant dryer and flows downward through a bed of silica gel desiccant. As the desiccant removes the water and becomes saturated, the color of the desiccant life indicator turns from blue to white. The air then flows through an integrated dust filter up to the outlet port of the dryer. The air is dried to a -40°F dew point and is ready for use. With the air lines drained of moisture, a desiccant air filter stops moisture and oil through to the repair surface. This filter will prevent fisheyes from occurring in the repair surface during the spraying process. It is common to have so much moisture in the lines that the water is visible when the air pressure is released through the lines. Therefore, drain the compressor often so there is no visible sign of water. Also, drain air source lines and hoses. With the compressor drained and air pressure recharged, open up and run dry/clean compressed air through the lines until the lines and hoses are cleared of moisture. 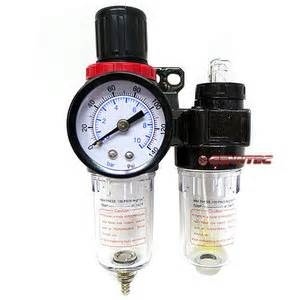 Now attach an inline desiccant filter before or after the regulator and you will see a difference in the coating application performance.